An English pub is more than somewhere to just have a beer. For many people it is an extension of their home. To own a small pub of one's own is a dream for some and many pubs were once part of a handful of places owned by small breweries. Sadly, over time the small establishments have been taken over by the large chains, complete with their gambling machines and garish neon lights. But enter through the doors of the Princess Louise and you will quickly learn how special these little establishments can be. This one is part of a group established in 1758. Chris and Scott told me how Samuel Smith Brewery make their own beer from the original well in Yorkshire. They assured me that it is easy to recognise a Samuel Smith pub because they are all as beautiful as this one. Cheers to that I say. Yes the Princess Louise is wonderful. It's difficult for people to make a living running pubs these days, as with so much else. Wonderful! I like your pubs very much. These are indeed special places. They've their own atmosphere. I like their signs, the names and some pubs have wonderful flower arrangements at their windows. Running a pub is hard work. My grandmother ran one in Essex, then my sister and brother-in-law in Blakeney and finally their younger daughter and son-in-law in Letheringsett. They were glad, after several years, to leave it and the unsocial hours. Lovely old pub, not many left like this. Love that Victorian glass. 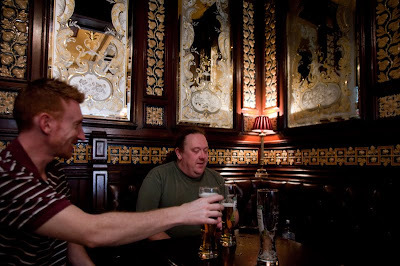 That's one of my favorite things about northern England when I lived there.... the local pub was like the local living room. Christmas morning at the local pub was also a great experience. People you haven't seen in ages come out of the woodwork to mingle around a pint! Nowhere does pubs better than the Brits. Looks so inviting. English pubs serve such an important community purpose. It is distressing to read that this is changing, but heartening to read that the Samuel Smith group is preserving the wonder and beauty of their pubs. Is that Johnny Vegas you're drinking with? ?